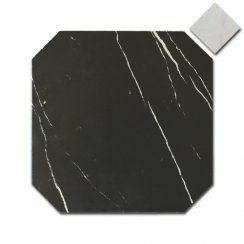 Team - I'm having a lot of trouble nailing down what I want for the kitchen floor. I know most do hardwood and although that option isn't totally ruled out, I prefer to do tile. But I can't find anything I like that isn't complicated. 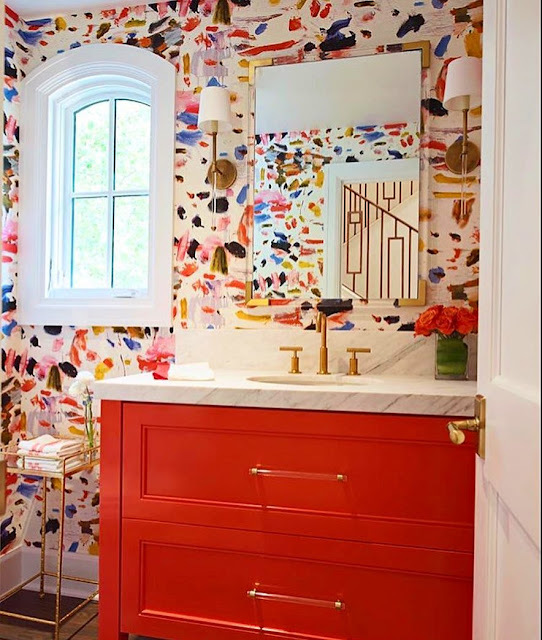 I really like the vibe of this below from Miles Redd. 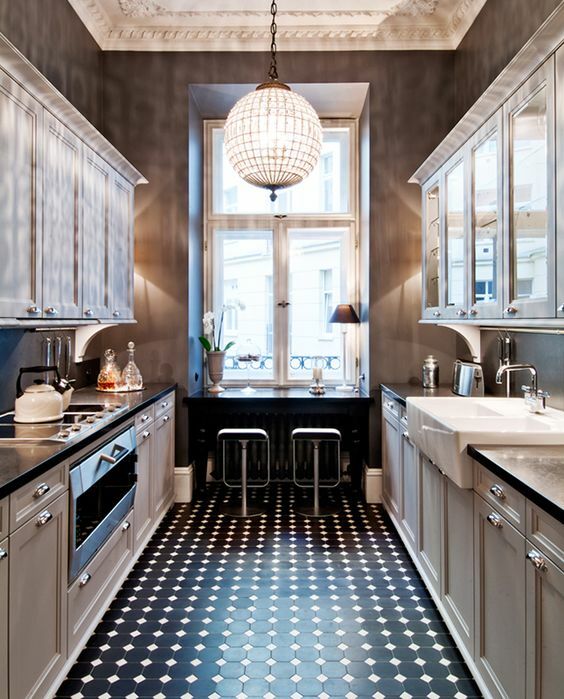 I always like black and white but I think I want to stray from the big checkerboard we had in our last kitchen. What do we think this is? Marble? 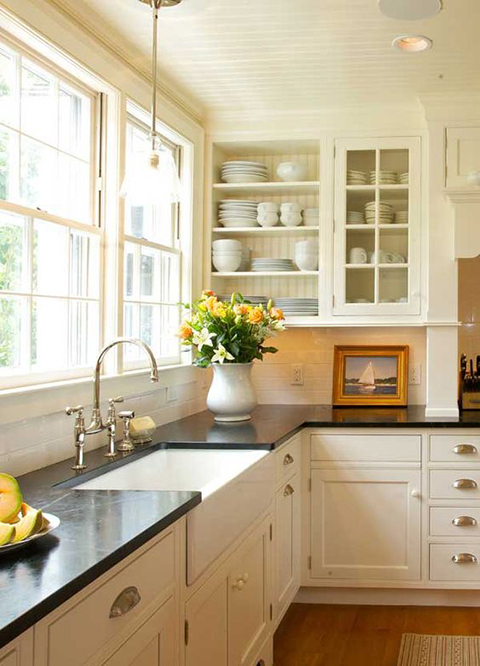 I like that it's classic black and white but has a tumbled/worn appeal. And that the checkers are not equally sized. Anybody want to fill me in on sources to recreate? Guesses on material? Maybe travertine? 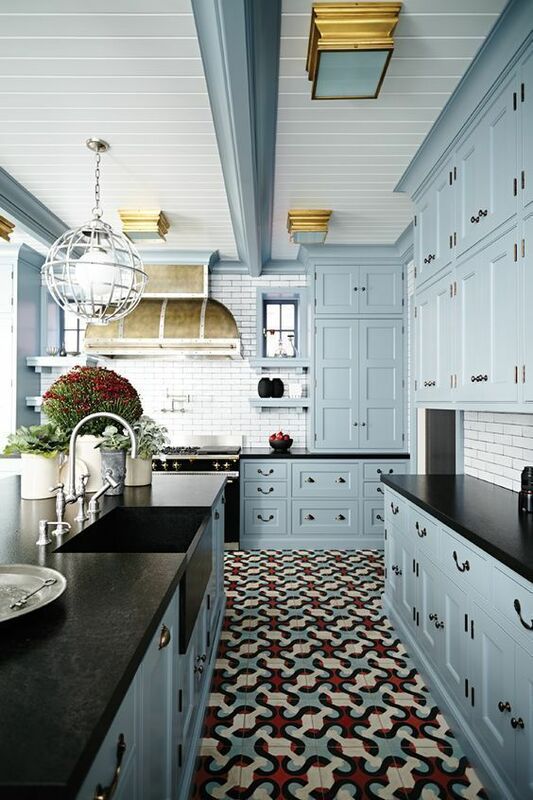 I'm also going down the cement tile rabbit hole - solid colors. I don't want a crazy pattern. Just something simple with some soul. We're going with powder blue! It's a lovely light, powdery, celestial blue with just enough gray to not feel too baby-colored but the blue still dominates. 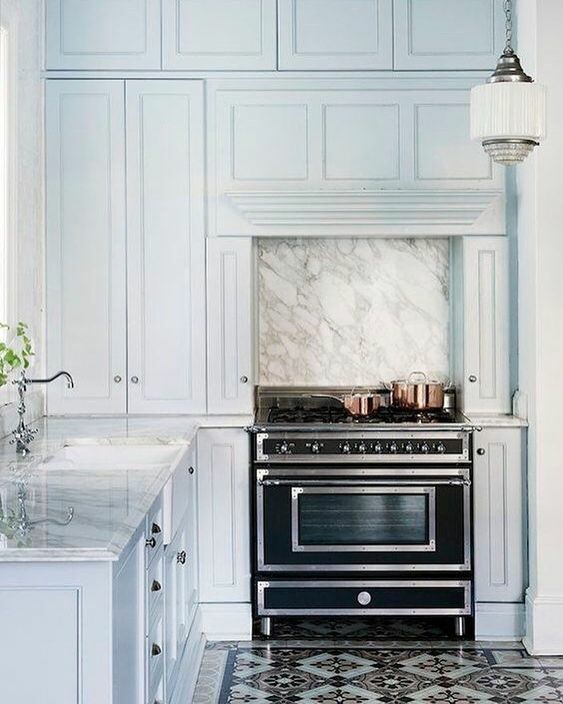 I'll share more details with the full plans but I'm taking the kitchen in a warmer direction than some of these pix - not accentuating the gray and silvery tones...looking for the warmer tones to juxtapose with the cool blue. Hand claps for Carter Shuffler who lobbied for the color. I was really going to play it safe with the off-white which would have been lovely, but I think we're going to enjoy that we pushed it a little in this space. p.s. Over my baby-having blogging hiatus, my blog was getting hammered with spam in the comments. So I made it kind of hard to comment. But I love comments so it made me sad. Hoping to make it easy again soon. We have so many fish to fry right now, that I sadly know our own master bedroom will not get any attention (or budget) for a while. But I'm actually quite content with this snail's pace because I'm really thinking through what I want. 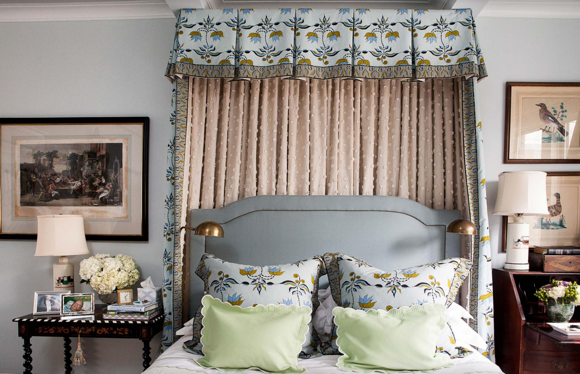 And what I want has many similarities to this - the Manhattan bedroom of CeCe Thompson. A fabric canopy situation is on my wishlist...except there is a window behind our bed so it would be more of a curtain/bed canopy combo. But framing the bed as a focal point sounds great. And although my dream sequence includes built-ins around the bed to create an alcove, I will settle for nice bedside tables, namely that secretary number on the right. Unfortunately we don't have dedicated office space so having somewhere to prop a laptop on occasion would be helpful. 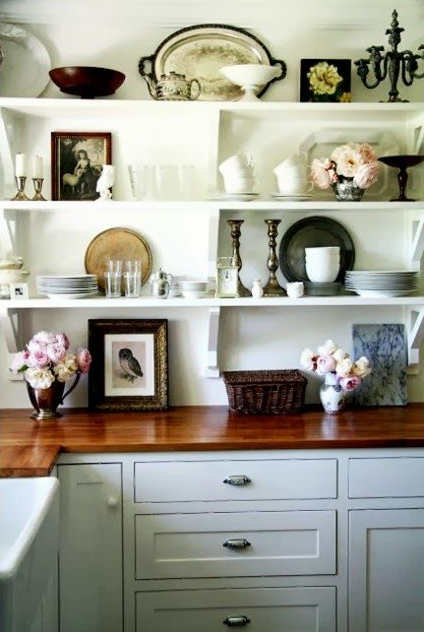 That dainty table on the left is lovely but storage is at a premium, so I'm also hunting for a bachelor's chest to be opposite the secretary. 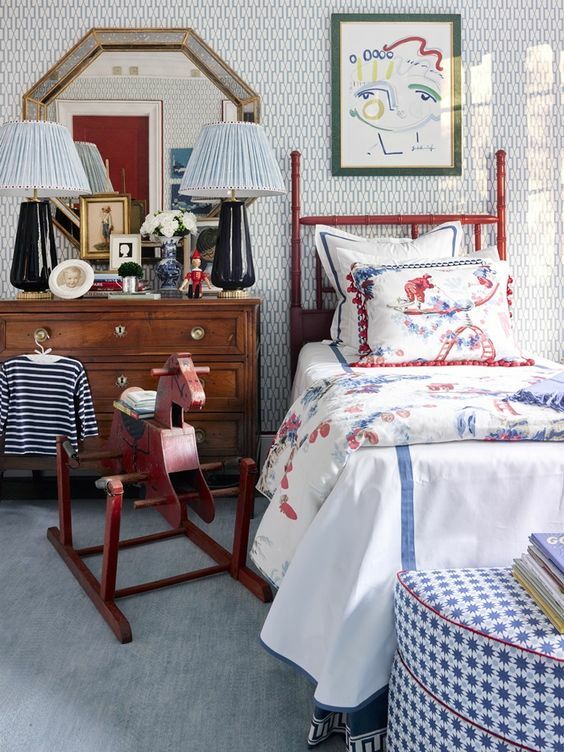 I've always loved the look of complimentary but not matching bedside tables. 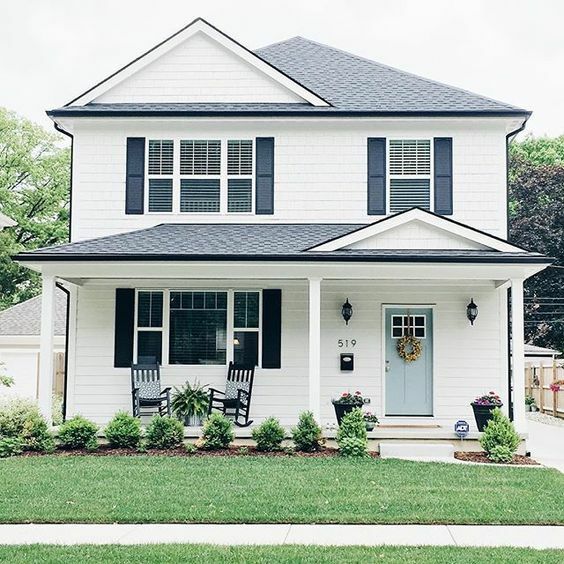 Just like our last house, we have decided to paint the brick exterior of our new house. Last time, we put this project off for many years and then instantly regretted waiting so long once we saw the finished product. So this time, painting the exterior is one of the first things we'll be doing to update the house. If you remember our last house, we opted for green on green with a bright red door. And we loved it. 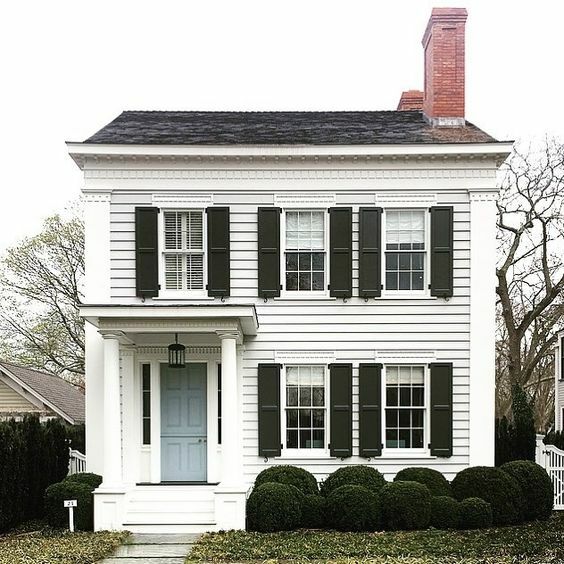 This time, I'm craving a classic white house with black windows (actually what I wanted last time but our roof color wasn't going to work). Note I said black windows because that is currently what we have and it was one of the selling points for me. We are going to remove the shutters completely and try that out for a bit. 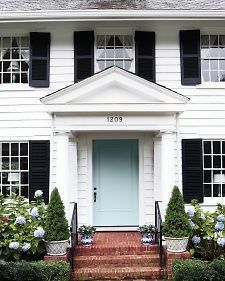 And although I am Team Red Door at all times...I'm actually leaning toward powder blue this time. 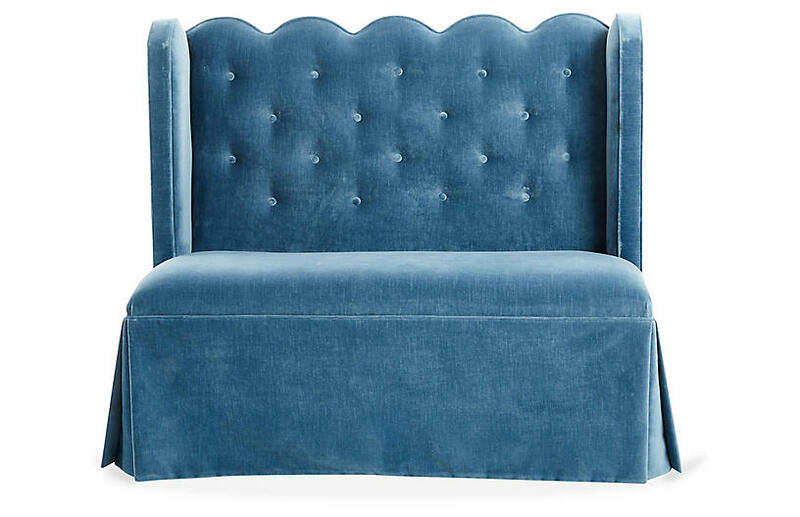 This shade of blue is going to have a big moment inside the house and I want to give the exterior a little tease of what awaits. We'll be evaluating the gamut of off-white whites shortly...but I'm turning to the Internet because I know this problem has been solved. 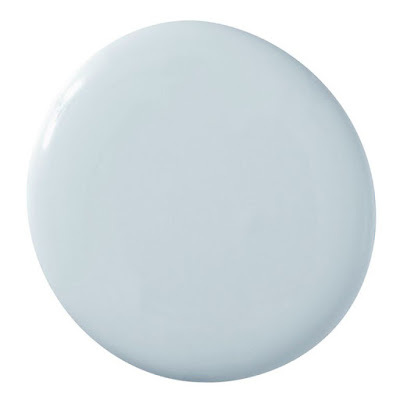 I've always been a Sherwin-Williams Alabaster lady but am going to compare to Ben Moore's White Dove due to its cult following. I've already nailed the blue which I'll share in a later post. Well, that was a cool two months with no blog posts. I have come to learn that in my new life of 3 kids and a new house, I can't make promises. Because I no longer keep them. But I do know that my brain is full of blog posts so I just need to push to put them down here for you and me to enjoy. Like what's going on with our foyer. Our foyer that still doesn't exist, but we do have a concrete plan for building it with our contractor. 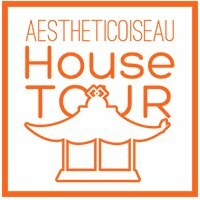 If you remember, I already had some plans for our foyer before we moved in - see this post. 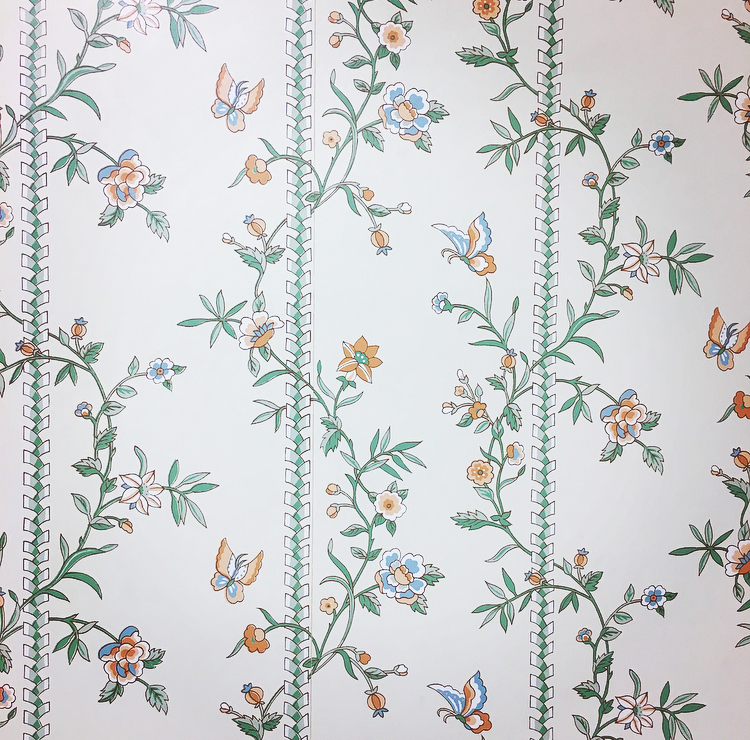 But alas, the vintage wallpaper was not nearly enough to cover what I needed, so I began a new wallpaper search. Sidenote: I think I have ordered every wallpaper sample available in the United States. But I am happy to report that after months of samples, pondering, self-doubt, and excitement, I finally landed on Manuel Canovas' Bengale in the Grenat colorway, which is a boisterous explosion of crimson and purple. We are not being shy in this new house. Our foyer will be a small space so I wanted to go big with the walls. And you know I've had a long love affair with shades of lavender and purple. 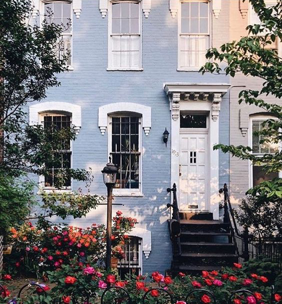 I've also picked a couple of places where I plan to accent the first floor with touches of red, so it felt right that the house should warmly greet us with this color palette. We have been deep in plans for six months and we are finally on the precipice of starting work on the house. Hopefully this propels me to share on a more frequent basis now that some real decisions have been made. I know this room is seeing the rounds on the Internet, but this particular shot of it really spoke to me. An ongoing exercise I have been doing for at least a year is to save images that nail the vibe I want in the new house. 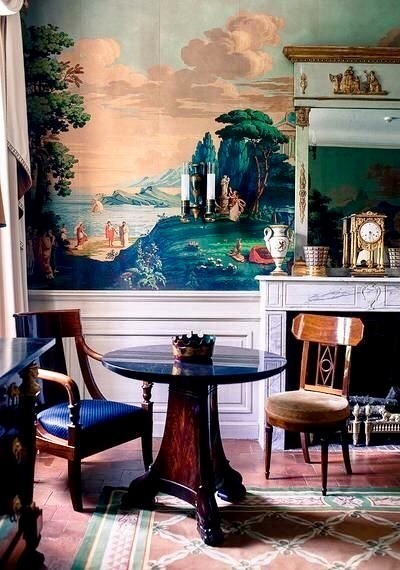 Not necessarily spaces that I want to emulate, or that have a certain fabric or piece of furniture I like, but spaces that holistically have a look that I often find hard to describe. Like this example. I'm not planning on recreating any particular element, but the overall look is on my radar. Traditional. With wonderful use of color. And the color doesn't overwhelm, but elevates. 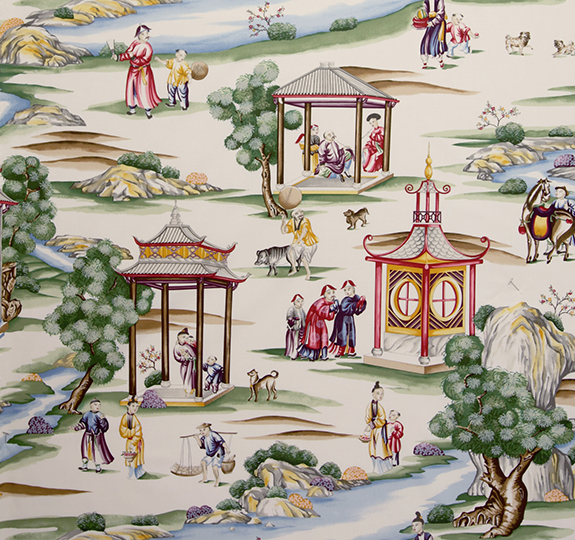 Obviously there is always some Chinoiserie. 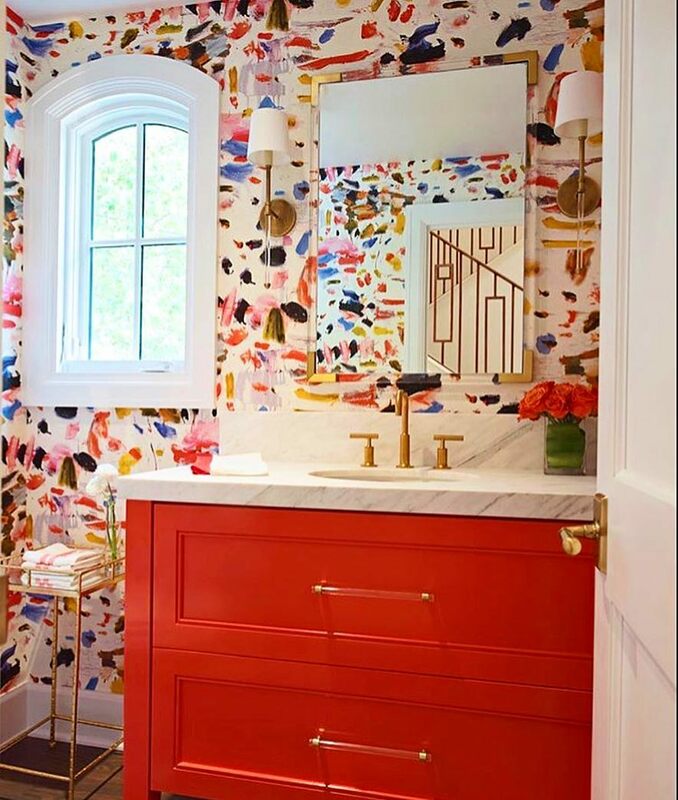 Color palettes are usually pretty tailored, with room for a small complimentary color to make an appearance. All the layers - pattern, color, texture. As I share inspiration, I think you'll see a definite pattern emerge. Hope you have a great weekend. See you next week! Turns out, we are ripping out the current kitchen and putting in a new one. "Ripping out" sounds so harsh, doesn't it? 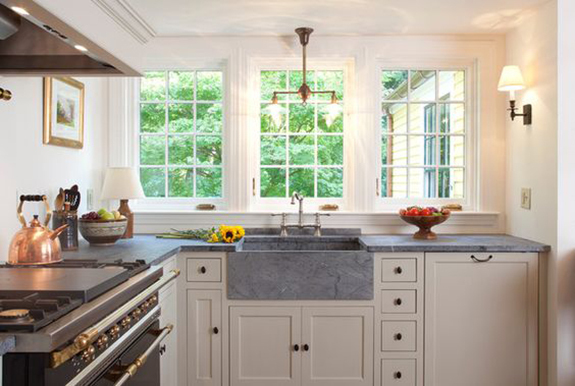 The current kitchen is a sweet, albeit outdated, space that I know was lovingly cared for by the home's original owner. But it's not working for us...so renovation it is. Of course, I'm thrilled about this. And I'm also stressed about getting it right. The constant tug-of-war of decorating emotion. 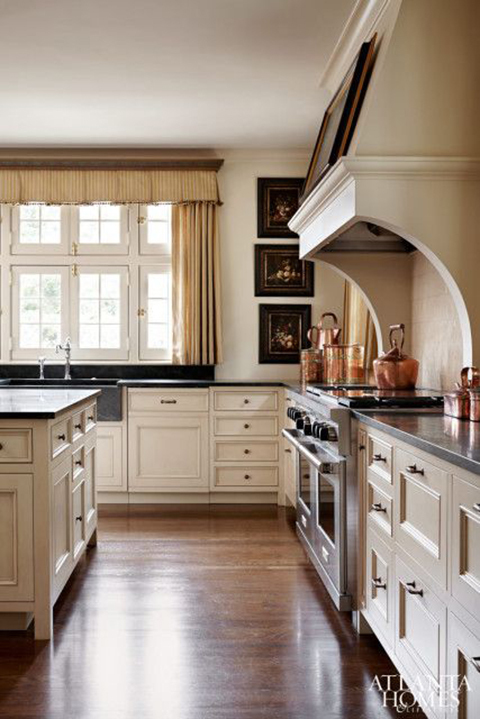 I want a kitchen that is simple, warm, and classic. Definitely painted, but not white. 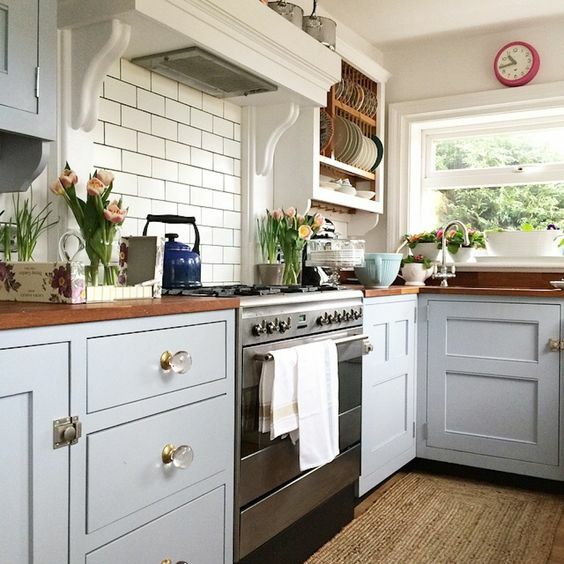 Our old kitchen was crisp and bright with a jolt of color. 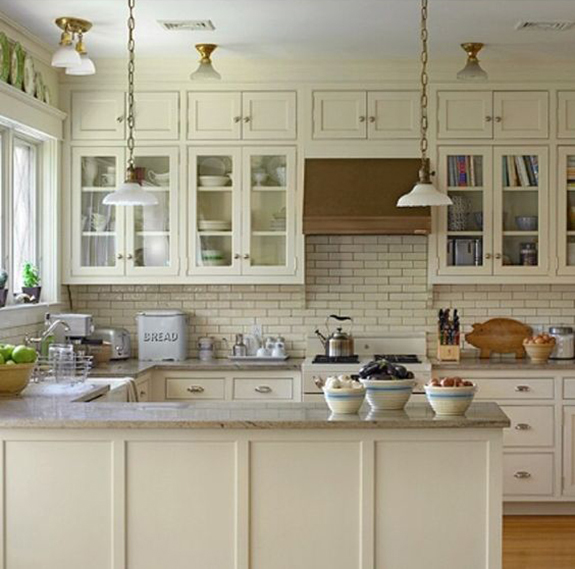 Now I'm looking for neutral tones and simple lines that almost fade into each other (ie inset cabinets, shaker-style doors, low contrast materials). The big question is color - green or off-white? Pic #3 is close to what I'm thinking should we choose to go green. 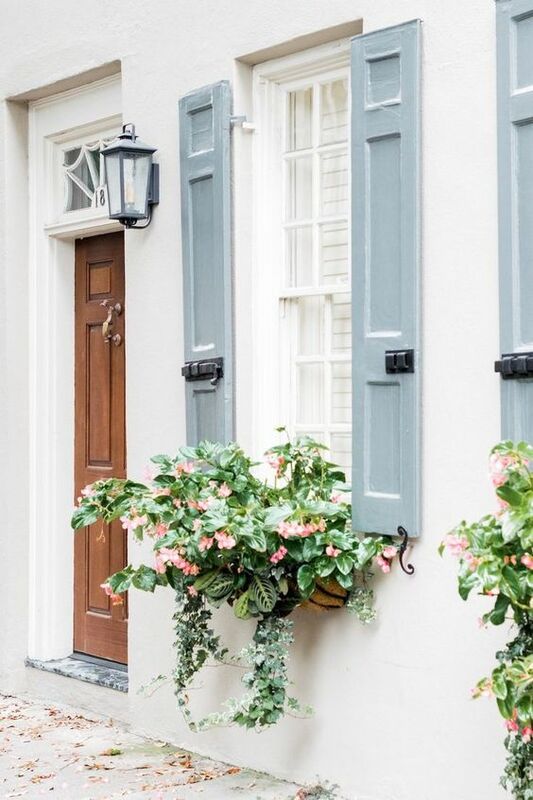 A situation where all surfaces have the same color so the overall look still reads pretty neutral. 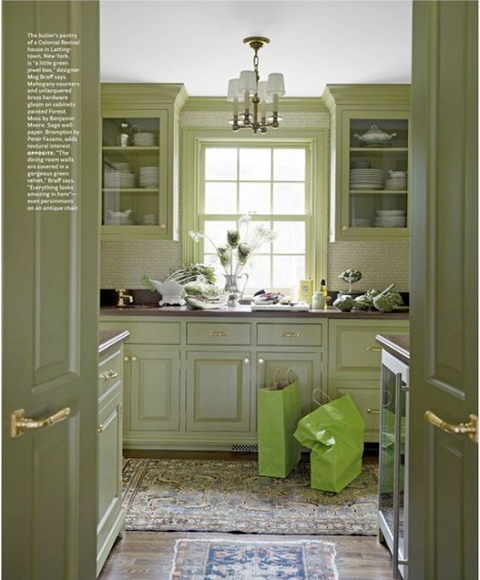 But I sure do like the idea of off-white cabinets, perhaps paired with a statement floor tile. So that is my inner monologue at the moment. 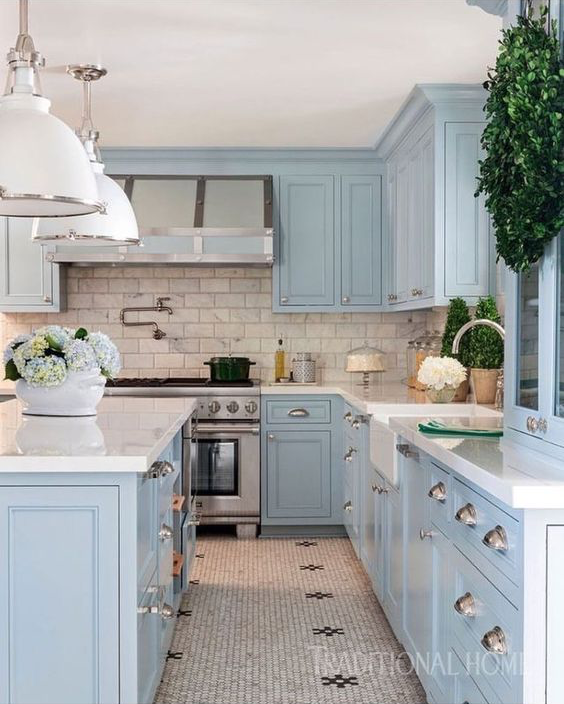 I also had quite the ah-ha moment while revisiting my Pinterest boards to identify my favorite kitchen pictures...there is nary a statement backsplash. Or a backsplash at all. 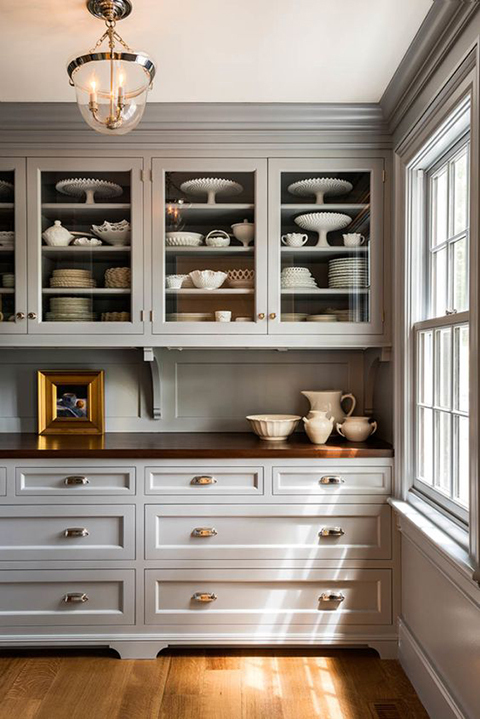 Granted, some of my inspo pix are butler's pantries, but still. I get it. I don't want a fancy background. Though the function of cleaning these slivers of wall is still a thing to think through. We've pretty much outlined the layout - a wall is coming down! And now is the cabinetry. After that, we'll hit the counters, hardware, floor, and lighting. So. Many. Decisions. Friends! I'm here! 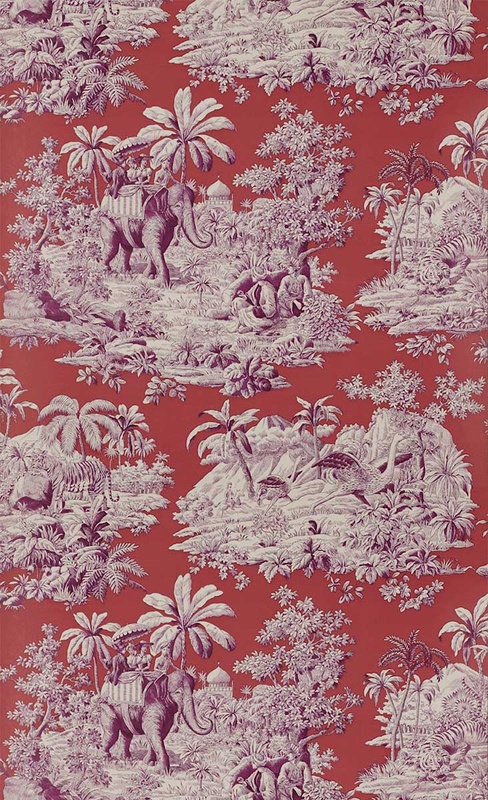 And I'm going to put Scalamandre's Shanghai wallpaper in my new dining room. Dreams do come true. I have so many updates. So, so many. 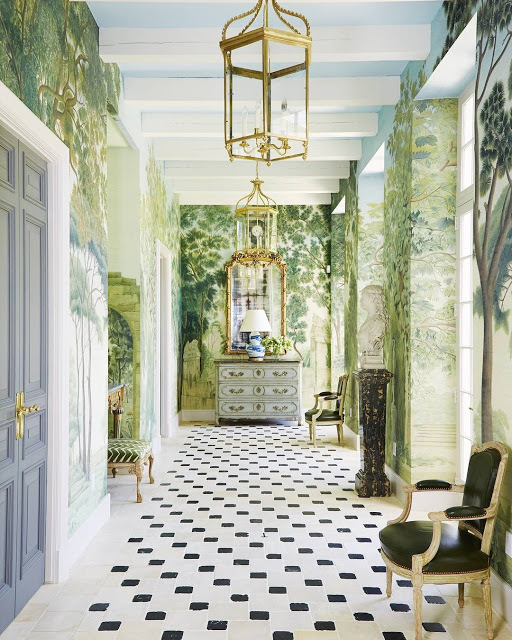 But really, few beat this bit of news re: wallpaper. I've had the sample taped up in the dining room for a couple of months now. And Carter Shuffler is on board. I was preparing Power Point presentations to convince him that using this paper would be a solid move that would pay dividends in the future. High ROI. But he was in agreement pretty much immediately. Good man. But they aren't here yet. We still have moving boxes tucked into every corner. Our new microwave and dishwasher might be sitting in our living room. But we'll get there. I'm actually pretty happy that we are taking our time. Not only because doing work on the house will be so disruptive (hello three kids) so I'm avoiding starting, but also because we are being v thoughtful with each decision. I've missed y'all! Haven't quite worked out what my regular posting schedule will be like, but I hope to start ramping up and getting back to you with some regularity. Well, hello. It has been an eventful month. The movers did come on November 29th...and we welcomed baby boy on November 30th. Meet Carter Leo Shuffler...he's going by Leo, because why go by your first name when you can go by your middle? He is a delicious dream. Chill and sweet and making the move much more bearable. But the move has been exhausting. Unpacking is no joke. We are going on week 3 and only now feeling like we've made a dent. But we're making progress. I've said it to friends and family, but the sheer chaos of it all has made it easier. I don't have time to think or second guess or fret over change. We've just had to move forward and embrace all the newness. Though let's be clear that it's only been easier for me and Carter...the older kids are losing their minds on a daily basis. They are craving some normalcy, and I don't blame them. We'll get there too. In decorating news, I'm contemplating cafe-ish length curtains for Leo's nursery. Surprising.